Even though The Zombie’s music was written in the 60’s, their songs are still adored by fans today. The upbeat mix of psychedelic pop and rock stays true through time for old and new listeners. Their music transcends generations connecting with more people more every day. 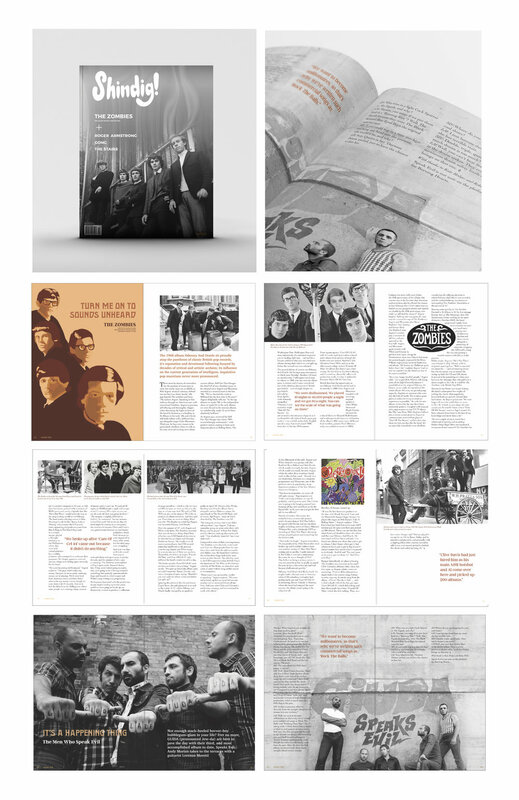 It was difficult gathering all of the assets for this magazine spread because the photos of the band are limited. After looking through the images I could find, I drew some stylized illustrations intertwining each of the band members similar to the mixing of harmonies in their music. Once you revisit a project, everything seems to fall into place better than it did before. I came back to these designs and did some rearranging with some photographs and repositioned the illustrations on the opening spread. It came out better than I expected. When I discovered Shindig!, I was drawn to it because of the nature of articles they provided about new and old artists. Flipping through the pages of spreads reminds me why designing for print is so special. There is something magical about having your designs printed and in your own hands.